Pleasure Pole dance poles are designed to allow you to enjoy the experience of pole dancing in your own home. Specifically designed to be easily removable the Pleasure Pole is an ideal piece of ‘fun’ equipment. Leaving the adult aspect aside, a pole dance workout is an excellent way to get in shape and keep a high degree of fitness. Both types of Pleasure Pole are made to your requested length with the final adjustment made by a threaded adjusting foot. Please specify the ceiling height when ordering your pole so we can ensure it will fit correctly. 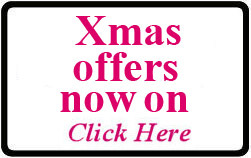 Poles up to a total length of 280 cms are at the published price. Longer poles can be supplied on request. you can Enjoy with Friends. Pleasure Poles are designed to install into a standard room with the minimum of tools, expertise and disruption. After initial installation the pole can easily be removed and stored in a wardrobe or beneath a bed to be taken out when required. With the non slip adjustable base the Semi Removable Pleasure Pole can be installed on either a carpet or polished wood/tile floor with no fear of damage or marking. Supplied in a single piece the Semi Removable Pleasure Pole is manufactured from polished Stainless Steel. The adjustable non slip foot is also made of Stainless Steel with soft neoprene non slip pad. The Pleasure Pole comes with a custom made adjustment wrench to make installation and removal easier. (See installation details (1) below). The completely removable pole gives all the benefits of the fixed pole, with the advantage of absolutely no drilling or permanent marks. This design allows the pole to be installed and removed in seconds, no tools are required and there is absolutely no marking or damage to the room ceiling. 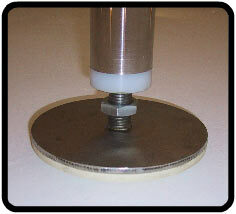 The pole is fitted with a threaded leveling foot on both ends. Both feet have a high friction elastomeric pad on the surface. The pole is positioned directly beneath a ceiling joist and the leveling feet are screwed out until contact is made between the floor and ceiling. At this point a firm twist of the pole locks the pads tightly against the ceiling and floor. A turn of the lock nut ensures the pole remains tightly in position. The pole is now ready for use. (See installation details (2) below). 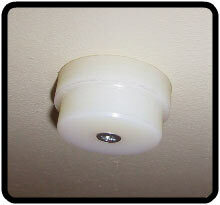 The "SWIVEL" Pole has a bearing assembly fitted to both ends which allows the pole to fully rotate. This gives extra durability and can promote more difficult moves to be performed. Installation is per the fully removable pole. The ultimate Pole Dancers Pole. Offering static or spinning options this pole comes in a custom designed canvas carry case housing the individual pole sections. The unit has been designed to accommodate ceilings heights from 2200 mm up to 3500 mm. 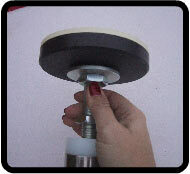 The high friction pads ensure ease of operation but at the same time will not mark or damage the ceiling. 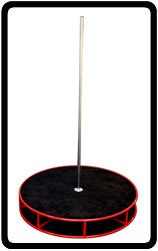 Ideal for venues with a high ceiling, this self contained dance stage securely holds the pole at the base. underneath the stage to ensure the podium is secure. It's as simple as that. Insert the top of the pole on the location boss attached to the ceiling and stand ensure the pole is vertical. The adjusting foot can now be extended out from the bottom of the pole to “trap” the pole between the ceiling and the floor. As the non slip surface of the adjusting foot starts to bite it will be necessary to turn the pole to increase the installed pressure. As a final adjustment the wrench supplied can be used to turn the base a quarter turn. Lock this in place with the locknut supplied. It is important the pole is situated far enough from walls and furniture to allow clear working space around the pole. As this is a fully removable pole it relies on the friction between the two pads to hold it securely in position. With this in mind it is important that the ceiling is of a strong enough design to with stand the “jacking “ effect of the pole on tightening.